Second part of the interview given to LVSL. Here, the first part “Break the Taboo on Odious Debts and their Repudiation”. Eric Toussaint (E.T. ): Yes, it’s obviously extremely important to analyse the case of Greece. In fact it was simply a matter of Alexis Tsipras being unable to adopt a strategy that was appropriate to the actual context in which Greece found itself. If you look at the Thessaloniki Programme presented in September 2014, which is the platform on which he was elected in January 2015 (see the excerpts from the programme in my article: The Varoufakis-Tsipras Line was), there was a whole series of very important commitments in it that included a radical reduction of the debt. There were measures that would have brought about radical changes concerning the brutal austerity measures that were being taken, the privatisations, and the way in which the Greek banks had been bailed out. As Prime Minister, Tsipras took an approach that was not at all consistent with his programme and with the commitments he had made. But what is extraordinary, and absolutely needs to be underlined in Tsipras’s case, is that a few days after he was elected in January 2015 and formed his government, before he had taken any measures whatsoever, on 4 February the ECB cut off the normal flow of cash to Greece’s banks (The Varoufakis-Tsipras Line was and Varoufakis-Tsipras move towards). That was nothing short of a declaration of war. And Tsipras did not have the courage to use the weapons of self-defence that were available to him: he did not suspend repayment of the debt, and that led to failure; he did not take control of the banks, nor did he take measures to control capital movement, and that allowed capitalists to organise the flight of capital (some thirty billion euros left the country between January and July 2015). His strategy was to make very rapid concessions to the Troika, made up of the ECB, the IMF and the European Commission represented by the Eurogroup. The latter is in fact an entity that has no legal structure and does not exist in the treaties. And yet the Tsipras government agreed to be imprisoned in it. Yanis Varoufakis would negotiate and sign agreements with the Eurogroup, which at the time was chaired by Jeroen Dijsselbloem. In my opinion that strategy led to an initial capitulation on 20 February 2015, almost immediately. Agreeing to extend the memorandum of understanding for four months, to stick to the calendar of repayments and to commit to submitting proposed extensions of the reforms to the Eurogroup amounted to remaining in servitude (see The first capitulation of Tsipras). Many people have interpreted that as adopting an intelligent attitude, as a tactical manoeuvre on Tsipras’s part. In reality the terms of the agreement of 20 February 2015 amounted to surrender. It imprisoned him for good. He would have had to back-pedal by admitting to his people and to international opinion that he had been naïf in agreeing to the terms of that 20 February agreement. In reaction to the Troika’s refusal to respect the expressed will of the Greek people, he should have announced that in making concessions, he had wrongly believed that the Eurogroup would also make concessions. In the face of the Eurogroup’s refusal, he could have concluded that he needed to change his approach. But he didn’t, despite the fact that he had the legitimacy to do it, which was evident later when he won the referendum in July 2015. But even after that vote, he did not comply with the people’s will, even though he had made commitments to do the opposite of what he in fact did! So it was Tsipras himself who prevented a movement towards repudiation of the debt, among other things. E.T. : Well with Italy, we’re at a stage where you get the impression that the Salvini government–for which I obviously have no sympathy–is being a little tougher than the Tsipras government was in the face of the diktats of Brussels executive. But that needs to be put into perspective, since whereas during the campaign Salvini was asking the Italian people for a mandate to leave the euro system, as soon as he was able to take part in setting up the government with Di Maio, he accepted the framework and the constraints of the euro. After that, until December 2018, the Italian government did appear to be standing firm when it came to refusing strict budgetary discipline. Nevertheless at the end of December 2018, we witnessed the capitulation of the Salvini-Di Maio government, which accepted a strict budgetary discipline with a deficit limited to 2,04 % of GDP as demanded by the Eurogroup. At the same time those governments, Greece being one example, have avoided disobedience. The government of Spain, under the Socialist Pedro Sánchez, is adhering to budgetary discipline. The same is true of the government of the Socialist Party in Portugal. You’ll recall that during the legislative election of 4 October 2015, the political Left won an absolute majority of seats in the Assembly of the Republic: the Socialist Party (PS) came in second, with 32.4 %; the Bloco de Esquerda (Left Bloc) was third with 10.3% and 19 deputies, doubling its number of seats (it had eight in 2011); the PCP gained a seat and had a total of 15; the Green party, PEV, was unchanged with two seats. A coalition government agreement was reached in November 2015: the PS would govern alone and the other two, more radical parties (Left Bloc and PCP), while refusing to take part in the cabinet, supported the government’s decisions in the parliament when they agreed with them. The minority government of the Socialist Party took certain measures which improved living conditions for a part of the popular sectors by increasing the legal minimum wage to 600 euros gross and restoring the legal work holidays that had been taken away by the previous government, which gained it a certain popularity. But it nevertheless maintained a policy of compressing public spending in order to comply with the budgetary discipline of austerity imposed by the European Commission, and conducted bank bailouts that were favourable to big capital. Portugal’s debt stood at 125% of GDP. The regular repayments prevented the government from increasing public spending as it should have, and despite the improvement in living conditions for some popular segments of the population, unmet social needs were still considerable. That is why it is of fundamental importance to call repayment of the debt into question (Interview with Eric Toussaint [in French with Portuguese subtitles]: La dette reclamee au Portugal est insoutenable largement illegitime et en). E.T. : In this case indeed, we need to know how to respond to the intent of the banks to destabilize or blackmail the government. Such actions of the banks would happen no matter what, and we would have to be ready. In order to hedge the risks the government should socialize the banks and the insurance companies while enforcing control on capital flows. This would make banks and insurance companies actually serve the people (see Patrick Saurin and Eric Toussaint, “How to Socialize the Banking Sector,” How to Socialize the Banking Sector). So as to better withstand the kind of blackmail or reprisals the European Central Bank used against Greece’s left-wing government, I propose an instrument that is not mentioned in the article in Le Monde Diplomatique. The European Central Bank (ECB), in the context of Quantitative Easing (QE)–see Box–purchased French securities from private banks for 420 billion euros. That is an extremely large amount, nearly a fifth of France’s total public debt. The operation is on the ECB’s balance sheet (official site of the ECB, Breakdown of Debt Securities Under the PSPP, ecb.europa.eu, consulted on 4 January 2019). These securities were purchased from private banks, but the French treasury will pay the interest to the ECB, and also the capital when the securities mature. If the ECB were to attempt to take a measure like the one it took with the Tsipras government against a government of the Left elected in France, then, faced with the ECB’s attempt to prevent it from carrying out its democratic mandate, the French government could decide not to repay that debt. It’s an argument that has considerable force and reverses the balance of power, which the ECB thinks it dominates. I’m astonished that none of the economists consulted by Le Monde diplomatique thought of it. Quantitative Easing has not been analysed sufficiently by economists in general, including alternative economists on the Left, who don’t seem to see what a powerful weapon it is in the hands of States once they decide to disobey. The Troika would be in a terrible situation. The policy of Quantitative Easing (QE) has been implemented by the ECB since 2015 in the wake of what the Fed had done in the U.S. from 2008 to 2014. It consists of massively purchasing private and public debt securities from banks in the Eurozone and from corporations. It thus pours liquidities into banks and corporations, which then use the money to speculate, thus making further crises more likely. Economic recovery is awaited in vain. The ECB put an end to this purchasing programme at the end of 2018 but decided to maintain the level of the stock of about € 2,200 billion of sovereign securities it purchased from private banks between 2015 and the end of 2018. This means that when sovereign securities come to maturity the ECB can buy more for an equivalent amount and thus pour further liquidities into private banks, who then buy more sovereign securities from France and other countries. Moreover the ECB uses this device to blackmail governments that do not comply with austerity measures and neoliberal reforms. Indeed if a government should decide to break away from austerity, the ECB could decide not to buy its debt securities when the old ones have matured. It could harm the said government if it decides to buy debt securities from a hard-line neoliberal government instead. This would result in increasing the cost at which the country finances its debt. 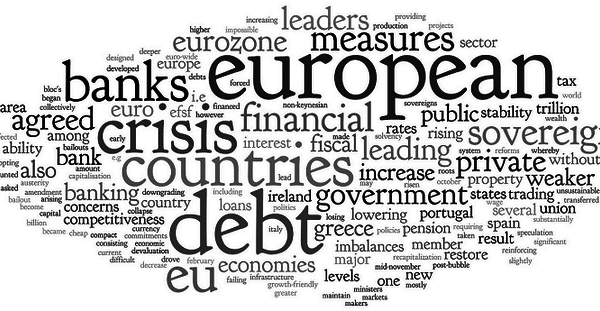 It is one of the reasons for which a legitimate government that wants to break away from neoliberal policies must immediately suspend repayment of securities held by the ECB and simultaneously launch a policy of legitimate public bond issues combined with an audit of former debts inherited by the previous regime, an audit with citizens’ participation, so as to repudiate the part of the debt that is illegitimate, odious, illegal and/or unsustainable. In this way, when there’s talk of panic on the markets and threats of deterioration of France’s rating, if France asserts that the country will finance itself otherwise than on the markets, the rating assigned to France by the agencies makes no difference. An alternative financing policy needs to be set up through a legitimate bond issue. The government should require the largest companies to purchase a given amount of French debt securities at an interest rate fixed by the public authorities, and not by the “markets”. That recalls what was called the Treasury Circuit (Circuit du Trésor), which operated in France between the Second World War and the 1970s. On that subject, you really need to read a thesis by Benjamin Lemoine, published [in French] as a book under the title L’ordre de la dette. The book tells you all about the Treasury Circuit, which has otherwise been forgotten. The Circuit du Trésor or Treasury Circuit refers to the way the French government financed itself after Second World War. We have to keep in mind that the Banque de France and four major deposit banks had been nationalised under pressure of the social movements in 1945-1946. The Treasury Circuit allowed the French government to borrow from the banks without depending on the financial markets. Banks had to buy a certain amount of French sovereign securities at a price and interest rate that had been set by the public authorities. Benjamin Lemoine explains that this worked perfectly for over thirty years and that the public debt amounted to much less than what would later be the case. Only in the 1980s was this ‘Circuit’ abandoned in the context of the neoliberal offensive. From then on France borrowed on the financial markets from private banks and other private financial institutions. So in fact what needs to be done is to restore an efficient and legitimate circuit for public financing.